With spring kicking off we’re on the lookout for fun and color and there are definitely a few new gambling games at online casinos that have been released onto the market that fit that bill. Extra Juicy Slots is a great start for anyone in the mood for light and bright fun. This 5-reel, 10 payline machine features colorful fruit, symbols that include watermelons, plums, cherries, blueberries, oranges and lemons, with a bell thrown in here and there. Cherries are the highest-paying, so if you catch five across the reels you’ll really get bang for your buck with 100 times your original stake. Diamonds serve as Wilds in this title, popping up on the first, third and fifth reels, with the potential to trigger progressive multiplier features: you start off with 12 spins and the win multiplier increases each time. 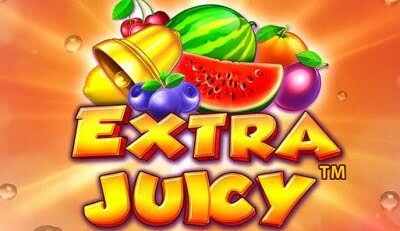 Extra Juicy also offers a bonus round which may be triggered and then re-triggered up to four times and it puts players in the running for a jackpot of a whopping 60,000x their original stake. We’ve also been enjoying Sweet Bonanza Slots which was recently released by up-and-coming software developer Pragmatic Play. This creation has tumbling reels named so because new symbols can “tumble” into place until there are no more wins, as well as free spins containing multipliers, which offer a win potential of up to 21,100x the original stake amount, (sometimes companies refer to this feature as “collapsing reels”). The freeroll capabilities are really what wowed us with this one because with four or more scatters, 10 extra games are triggered, with the potential of more being added as you spin. Things then get really crazy since if you don’t trigger this normally, you can actually buy free spins for 100 times your stake. During this round there are random multipliers of up to 100x that stay on the board until the whole thing is complete. In the spirit of “fruity reels” we also liked a new, more traditional fruit machine style game, Juicy Reels Slots, a release by virtually-unknown developer Wazdan. This 6-reel 20 payline game is retro in feel but modern in graphics. It has the standard Scatters, Wilds and free spins, (Up to 30, with potential for 3x winning potential! ), but it also offers some features unique to Wazdan games, including “Volatility Levels” that allow players to customize payouts and their “Unique Gamble Feature”. The gamble ability enables you to wager your winnings up to 7 times in the hopes of doubling up with each one – this is definitely some high stakes action. Check out these awesome newbies and everything else on the long list of slots at BitStarz Casino, where new and enticing bonuses are always on offer and a great sampling of fun promotions.